Through The Hills is an action packed adventure story, with multiple interesting characters, terran and alien, to follow and learn more about. In addition, the large tapestry of a tale of conflict between seven intelligent species over the future of Planet Sarnia plays out in the background to the action. My publisher’s idea of a blurb. Buckle your seatbelt, fasten your protective gear and get ready for action, humor, … and characters who will keep you turning pages as you share in their quests. Welcome to Sarnia. More than the book’s title, this serves as a greeting – as you embark on the first of your nine serial missions to this planet. This sci-fi adventure transports you to the distant planet and introduces the seven different, intelligent species living on the planet after the Terrans lost their gamble to colonize Sarnia. Enjoy the action as both Terran and alien must move beyond past conflict and learn how to coexist on the planet they all call home. This well written, captivating tale takes the reader seven centuries into the future to the planet known as Sarnia. Located at the junction of the Orion and Sagittarius Arm of the Milky Way Galaxy, Sarnia is also near the junction of three space faring empires. Previous events have left Terrans living on the planet dealing with life amongst six other intelligent races. For Sarnia host’s three intelligent indigenous species, who are unwillingly sharing their native world with two other species imprisoned there, while being administered by another alien species that has been hired by yet another, Sarnia’s current rulers, alien species. The nine book Planet Sarnia series examines the interactions of the various species over the period of a few quite interesting years, on Sarnia. For those interested in plot, the series has a large, multi-threaded plot that plays out over the entire nine book series as well as a tale related by each book in its turn. The storytelling is very good, with the tale freely flowing from section to section, in a very readable and entertaining manner. And there are many interesting characters, Terran and alien, for the reader to come to know. What happened to Terrans living on Sarnia? In their desire to expand Terrans decided that the risks involved in capturing and colonizing the planet known as Sarnia were well worth incurring. A mere forty years on they lost that gamble. Big time. 136 years later, many things have changed. Some never do. ‘Welcome to Sarnia’, the initial book, starts by introducing the core characters as they cope with realities of life on Sarnia. The reader is then launched into a somewhat traditional tale, though with many twists and turns, following our heroes as they learn of a new threat to the Terran community, decide what is to be done and begin their response. While the reader will encounter much that reminds him of home, life on Sarnia is very different, and much more dangerous than ours. The tale tracks an ongoing series of adventures affecting, sometimes afflicting, the group of very interesting characters recruited to assist the core heroes as Terrans begin to confront their new danger. 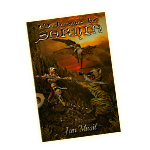 For more information about life on the planet known as Sarnia and the series of books concerning events there, please explore this website to view full color maps, review the list of interesting characters and read samples from the initial volume, ‘Welcome to Sarnia’.